Sloto’Cash’s galaxy is always expanding – and so will your wins this November when you deposit as little as $25 to watch how pulsating stars glow in your direction with up to 100 Free Nova 7’s Spins! 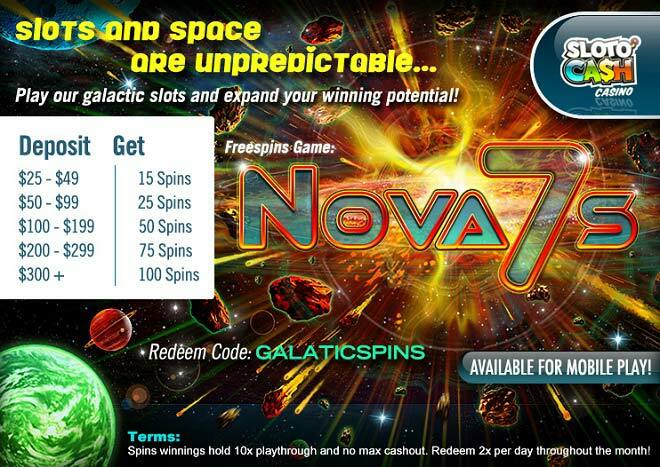 Launch into an intergalactic slot world when you spin the reels of our fantastic Nova 7’s slot. Travel to a winning galaxy with Free Spins and four bonus round features: the Nova7, the Supernova 7, the Hypernova 7 and the Hypernova Extreme! Outer space will land right in your fingertips this November with your deposits of as little as $25 giving room a whole new Sloto galaxy of Free Spins and wins!